Este artigo é sobre the person. Para the different rune spells, veja Rune (effect). 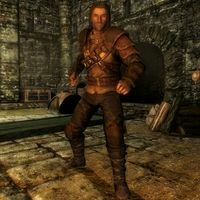 Rune, an Imperial thief, is a member of the Thieves Guild in Riften. He was found abandoned near a shipwreck on the north coast by a fisherman and has been trying to find out about his past through a runed stone that was found on him. After waking up at 8am, he skips breakfast and just loiters around the central area of the Cistern for most of the day. At 10pm he heads over to the training room and practices his blade skills on one of the targets for four hours. At 2am he heads for his bed, which is found in the tunnel leading to the Ragged Flagon. He wears the standard Thieves Guild armor, gauntlets and boots and is equipped with a steel dagger and a leveled bow (up to elven quality) supplemented by 12 leveled arrows. "Name's Rune. Yeah, rune... just like you're thinking." "Have no idea what my birth name really is, and I frankly don't care." "Being brought up by a poor family, I had to learn how to steal if I wanted to make ends meet." "Brynjolf actually caught me trying to pick his pocket in the market. If he was anyone else I would have gotten away with it." "I'm glad Brynjolf decided to let me join. Been trying to make some coin for him ever since." "I've never seen anyone with skills like yours. I just wanted to let you know that if you need anything, you can talk to me." "Something I can help with or do you just want to talk?" "My brother/sister in crime... what'd you need?" If you inquire about his unusual name he'll tell you his story: "My father told me he found me as a young boy in the wreckage of a ship that sank off of the coast near Solitude. All he found in my pocket was a tiny smooth stone inscribed with some sort of strange runes." If you ask him whether he knows what they say he'll grudgingly admit: "No one does. I've even taken the damn thing to the College of Winterhold. I must have spent every last coin I've made with the Guild trying to find out what it means." Saying that maybe it wasn't meant for him to know makes him reply: "Perhaps. They could be nonsense... inane scribbles done by someone in idle boredom. But if not... if they actually mean something, they might tell me where I'm from... what ship was I on. Everything." If you press him about who gave him the name he'll say: "Actually, the fisherman who found me, the man I call my father gave it to me. Thought it was fitting I suppose. I never changed it, because it never felt right to do so." At the last you may try to give him some hope saying: "I'll keep an eye out for anything. ", which leads him to say:"I appreciate that." Before you convince the guild of Karliah's innocence, he'll appear confused: "They say that Karliah murdered Gallus, but I'm not so sure." After though, he'll be impressed: "How can Karliah remain so calm when Mercer had her on the run for that long? Amazing." If you are suspended from the guild, he'll show empathy: "It's a shame you got booted from the Guild... things were going so well." Niruin: "Hold a moment, Rune. What did you think about my idea?" Rune: "Your idea to start a brothel, right? Do you want me to tell you exactly what I think?" Rune: "I think if Brynjolf catches wind of it, he'll boot you right out of here... so drop it already!" Rune: "Take a look around. Have you ever laid eyes on such wealth?" Cynric: "Never. This is the best the Guild's done since I've been a part of it." A note in the Cistern from a man hired to search for clues of Rune's parents' whereabouts states that it is as though they "erased all traces of their existence." Esta página foi modificada pela última vez à(s) 02h10min de 28 de dezembro de 2015.